Crop Quest offers numerous paid summer internships. Crop Quest Interns work directly with an experienced Agronomist during the growing season to gain hands-on crop production experience. 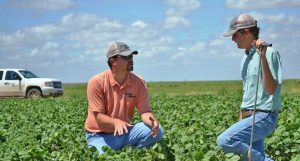 Interns are given priority for full-time agronomist positions upon completion of their bachelor’s degree. Crop Quest offers a competitive monthly wage for an internship. We have internships available annually throughout our territory, which consists of Kansas, Oklahoma, Texas, New Mexico, Colorado and Nebraska. Several times each year, Crop Quest recruiters visit college campuses to conduct interviews for summer internships and full-time employment positions with the company.